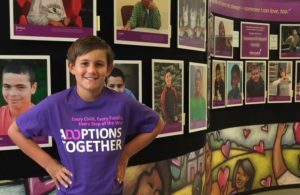 An Interview with Adoptions Together’s 2016 Heart Gallery Ambassadors! Posted on December 29, 2016 at 1:38 pm. This post is an interview with our 2016 Heart Gallery Ambassadors. Adoptions Together’s Heart Gallery is a traveling and online portrait exhibit of adoptable children in foster care living in the Maryland, District of Columbia, and Virginia region. As Heart Gallery Ambassadors, Joe, Wes, and Jake are advocates for foster care adoption in our community and do everything in their power to support the mission of older child adoption. Read about how they’ve grown the Heart Gallery here! Jake and the Heart Gallery, 2016. Liberty: As 2016 comes to an end, it’s time to check in with our Heart Gallery Ambassadors Joe, Wes, and their 11 year old son, Jake. Hi guys, and Happy New Year! Joe, Wes, & Jake: Happy New Year, Libby. Liberty: So, Jake. You have participated in a lot of Heart Gallery events this past year. Which one was your favorite and what did you like most about being a Heart Gallery Ambassador? Jake: I would have to say that my favorite part was welcoming people at the Taste in Potomac event. I shook almost everyone’s hand. Since they were coming to support the Heart Gallery and Adoptions Together, I wanted to let them know how much I appreciated them coming. Liberty: That was a fun night, and you did a great job greeting folks. Jake: I think that my second favorite part was riding the Zamboni at a Washington Capitals game as the Heart Gallery Ambassador. People waved at me and cheered, and I waved back. Liberty: That sound cool. Do you like hockey? Jake: I like hockey and my favorite player is Alex Ovechkin – I have a home team bias. But, I really like soccer and American football. My favorite soccer player in Lionel Messi; and my favorite American football player is Bronco’s Von Miller – by birthfather lives in Denver. Liberty: Have you met your birthfather? Jake: Yes, we have an open adoption so I know both my birthfather and birthmother. I even know my birth-grandfather and cousins. They recently came to visit me, and I showed them around the city. Between my birthparents and my adopted parents, I have the largest family tree of any one of my friends! Liberty: Wow! Do you ever talk to your friends about being adopted? Jake: Yes, at the end of our school soccer season, we played a kids vs. parents match. The kids wore t-shirts with the Heart Gallery logo, and we handed out Heart Gallery knapsacks and water bottles. Liberty: Did your friends ask you about the Heart Gallery? And what did you say? Jake: I told them that it is a special place where children who don’t yet have forever families still have a chance to go all out and hopefully get adopted. Liberty: That sounds great! Other than riding the Zamboni and hosting a soccer game, what are some ways that people can follow your lead and bring awareness to the Heart Gallery? Jake: For me, whenever I get into a conversation with a friend or their parents or my teachers about families, I always talk about the Heart Gallery. My advice is to keep talking about it. Because every kid needs someone to love you; to take care of you; to look out for you; and to have fun with you. Liberty: Joe and Wes, your family decided to start sponsoring the Heart Gallery in 2015. Why are you choosing to continue your support in 2017? Joe: We are really inspired by the number of children that were placed in forever families this past year because of the Heart Gallery. A total of fourteen children were placed in homes, and an additional twenty-one new children were placed onto the gallery. To answer your question, we support the Heart Gallery because we know how important it is to have a family. Liberty: Can you share with us some of the exciting things that will be happening with the gallery in 2017? Joe: Absolutely. In 2017, the Heart Gallery will begin using new mediums to reach the public. For example, we will be introducing two digital displays in DC which will show the photos of Heart Gallery children – and provide information about how to adopt them. We are hoping these displays can be located in high foot traffic areas, such as a children’s hospital or outside a family court. Later in the year, we are hoping to install similar displays in Baltimore and Northern Virginia. Wes: Folks can also still see the actual gallery, in person, next year. It will be at several locations, including the Metropolitan Council of Governments in January and at the Annapolis Public Library in February, as well as the Crofton Public Library in April, with more locations to be announced. Liberty: What is your hope for the Heart Gallery going forward into 2017? Wes: We’d love to see an increase in the number of Heart Gallery children placed with families. In 2016, the Heart Gallery prompted ninety-nine inquiries from potential families, up from fifty-three in 2015. For us, the sad part is when a child is removed from the gallery but doesn’t end up in a home. Some of these children are removed because they have aged out of foster care. This is heartbreaking because they still need a family. Liberty: What is everyone’s New Year Wish? Joe: I wish for a record number of children adopted from the Heart Gallery. Jake: I’d like to see the Broncos or the Ravens make it to the Super Bowl! 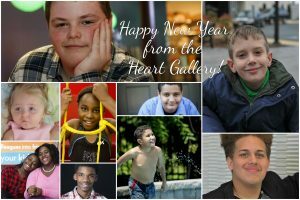 Joe, Wes, & Jake: Happy New Year to everyone, and thank you for supporting the Heart Gallery in 2016. Just a few of the children who’ve found permanent, loving homes with the help of the Gallery this year.